Use UbiFunctions to create your own API and gain access to data, APIs, and tools using HTTPS. One of the most exciting things about IoT is its broad solution architecture capabilities – giving engineers, developers, and innovators complete control from device management in the field to advanced project-specific data cleansing and anomaly detection for preventative analytics in factories. 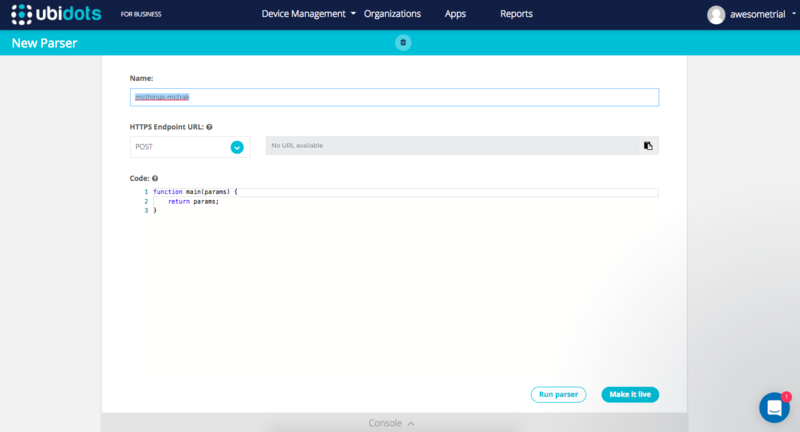 For example, you could choose to send data directly to Ubidots from an HTTP/MQTT capable device, or you can use a device-management cloud from the hardware supplier to receive data and then relay this data via a webhook to Ubidots for data visualization, calculation, and storage. If you then wish to overlay another 3rd party data analytics API, to enhance your data beyond Ubidots framework - simply export the data equally as easily with UbiFunctions. System Integrators have a new best friend in UbiFunctions as they can now connect a solution's IoT layers into a single display and platform. In the diagram below we see a typical IoT Solution. Here we can see the "Device Management" layer which can be used for OTA Updates, device reboots, and other essential hardware related features. While most of the above platforms are flexible enough to setup HTTPS webhooks or callbacks in the JSON format expected by Ubidots API, there might be instances where additional processing is required, and we designed the UbiFunctions engine just for these instances. 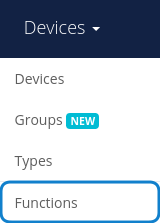 This feature can be accessed from the "Devices" tab of your Ubidots header by selecting "Function." Step 2: Give it a name that describes the type of device you're using. I recommend using the format "Brand-Reference", i.e. "mcthings-mctrack" or "digitalmatter-oyster". Please note the return payload must always be a dictionary. See here an example that parses the URL parameters of an HTTP GET request, and then uses them to make an HTTP POST request to Ubidots. 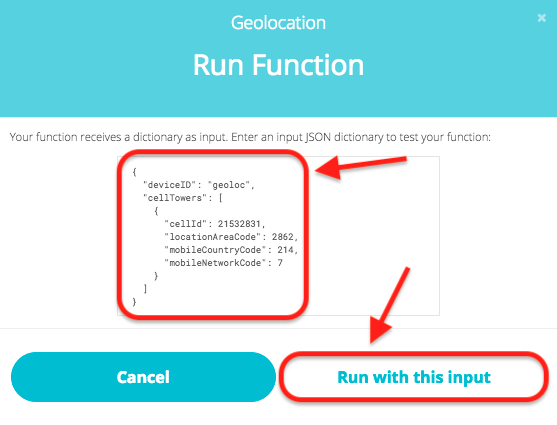 Click on "Run Function" to test your code. A modal screen will appear requesting the input data. You may leave this blank if desired. Output: This is what your parsing function returns. It must be a dictionary. Use "return" to quit the function and return the dictionary. Console: This is used for debugging purposes. Use console.log("hello") to leave trails in this console. Need help coding your parser? Feel free to ask for help to our support team via the in-app chat channel or via email at support@ubidots.com. Want to share a helpful parser to teach others how to connect the dots? Feel free to post it at community.ubidots.com and help another IoT innovator achieve their goals. 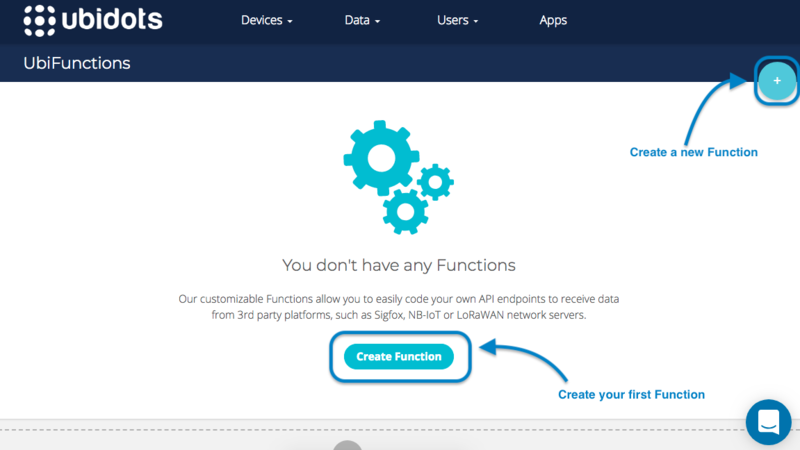 UbiFunction is an add-on that can be enabled at any time from any Ubidots Admin account or by clicking here.